Alright y’all…remember that last post (super yummy brunch casserole) where I told you we put the ‘For Sale’ in our front yard? Well, we received an offer on our house the next day, accepted it the day after that and had the home inspection done three days later. We had a handful of showings for two days and I am so thankful we didn’t have to do more than that! Exclamation point! This is my first experience selling a home and boy is it exhausting. Keeping your house ‘show ready’, aka in perfect condition, is a tall ask! Needless to say, we ate out for dinner a few days in a row and acted like we were the maids of our home rather than the residents. Our sweet furbabies were affected too. Our pup, Max, did not understand why he was going for so many car rides, shopping in pet stores and spending time at family’s homes and offices those two days. He was beyond tired in the evenings. We’re talking about nearly falling over from his upright sitting position as he was dozing off! The cats were able to stay in our home for the showings, but if you know cats you know any type of activity like this is stressful for them! It really warrants some new cat nip toys! Oh and during all of the selling activity we’ve also been searching for our next home! Basically, life has been hectic! And that’s why finding really quick and easy recipes that are delicious too is extra exciting! Easy cleanup is a big plus too, because we still have our home appraisal appointment to get through before we start heavy into packing and that means making our home ‘show ready’ one last time! 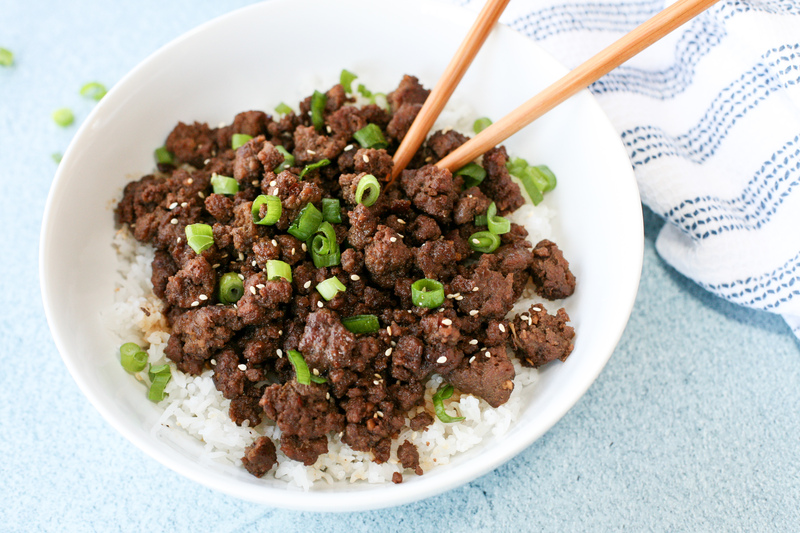 My favorite thing about this Korean ground beef recipe is once you buy the ingredients the first time, you’ll only have to buy the meat and any vegetables you choose to include the next four or five times you make it! I like the crunch of the green onions in the mix and typically add lightly steamed broccoli as well. To lighten things up a bit, the meat can also be served on lettuce wraps instead of rice! Yum! I have to call out the cookware I used to brown the ground beef, because the Calphalon Signature skillets (that all came with lids!! – seriously exciting for me) my parents got me for Christmas are amazing. Easily the best non stick skillets I’ve used! If you’re in need of new cookware, check them out! They are especially great for cooking scrambled eggs! And buying them from Bed, Bath and Beyond means you can always use a 20% off coupon at minimum! Well, there’s probably something I should go clean or photos of kitchens I should browse on Pinterest 😉 Recipe below, friends. Enjoy!! Cook the ground beef and garlic in a large skillet over medium heat until no longer pink. Drain grease as needed. Whisk brown sugar, soy sauce, sesame oil, ginger and pepper together in a small bowl. Pour over the ground beef, stir to mix well and let simmer for two or three minutes. Serve over cooked rice garnished with green onions and sesame seeds. Add steamed broccoli or other vegetable of choice if desired. *For some added spice, include crushed red pepper flakes or other seasoning of choice with the listed sauce ingredients! This entry was posted in Dinner, Recipe Book and tagged asian inspired recipes, beef, beef and broccoli, easy dinner recipes, ground beef recipes, homemade takeout, korean beef, korean ground beef, quick weeknight meals, weeknight meals. Bookmark the permalink.